The class that I TA for was coming to an end, which meant that lots of final reports were coming in for me to mark. To brace myself for the ordeal of hundreds of pages of reading, I went to have hundreds of calories of sushi. Since I had Patrick with me on this adventure, I unleashed my mighty fury and ordered as many dishes as I imagined that we could possibly finish. In my head, I thought that the more sushi I had, the sharper I would be while marking. 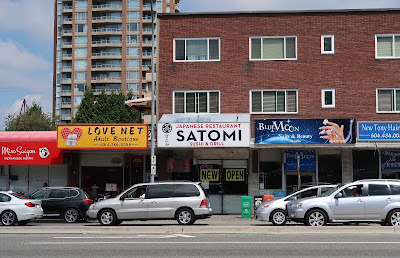 Satomi Sushi is a new authentic Japanese restaurant located across from Metrotown that has replaced Yakko Sushi, which was a place for budget sushi. 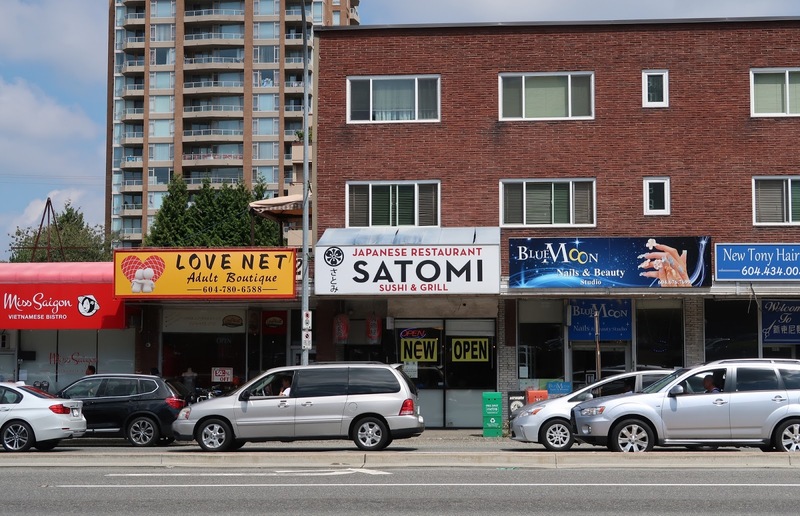 Satomi Sushi is priced slightly higher than Yakko Sushi, but surprisingly, after having been open for just a few weeks, it was already loads more popular than Yakko Sushi. Luckily, as we strolled in for lunch, we managed to snag one of the last available tables. Between the two of us, we ordered two lunch sets, an appetizer, and a few different types of sushi to get a good sample of their offerings. For some reason, they decided to give us all of our food almost simultaneously, which meant that we had to also take up the table next to us and look like complete gluttons for a few minutes. 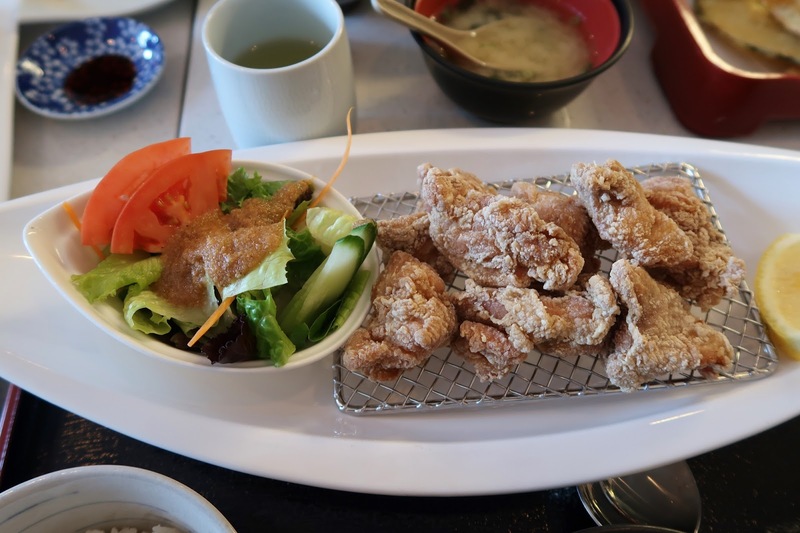 Our lunch started off on a high note with an excellent helping of Goma-ae. The sesame sauce was spread evenly to create a well-rounded sweetness that reverberated throughout the salad. 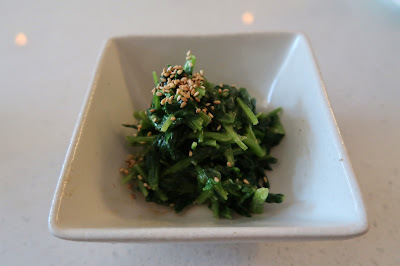 The spinach itself was fresh and cut into small pieces, which made it easy to digest. Onto our first sushi dish, the Aburi Spicy Salmon Battera was also successful. Patrick's comment was that the salmon just "melts in your mouth," and this time, I completely agreed with him. The salmon also projected a slight smoky flavour, and the jalapeño and spicy mayonnaise were well-balanced as not to overwhelm any of the ingredients. The texture of the rice was decent, and it was not too tightly packed. Not knowing which special roll to try, I went for the Blush Roll, which consisted of crab stick, salmon, avocado, and mayonnaise. The mayonnaise did a great job of tying the ingredients together, and the crab stick provided a nice meatiness to the roll. I'm not sure why it was called the Blush Roll though, as neither Patrick nor I were successful at making ourselves blush via eating the roll. We tried! Another interestingly named piece of sushi was the Salmon Scud Nigiri. The word "scud" refers to wind-driven clouds, and yet, I failed to sense any wind coming out of the nigiri. I was mildly disappointed. 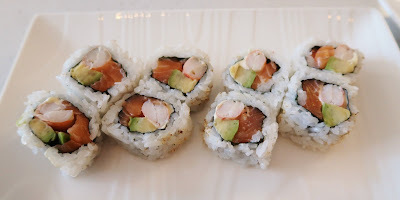 However, the salmon was fresh and nicely seasoned, while the tempura crumbs added a pleasant crunch to the nigiri. I also liked the garnish of green onion on the Aburi Tuna Nigiri, but the tuna itself was slightly overdone. Lastly, the Aburi Ebi Prawn Nigiri had a nice chew to it and was dressed with spicy mayonnaise to produce a rich, savoury flavour. After all the opening flourishes, it was finally time to move on to our lunch sets. 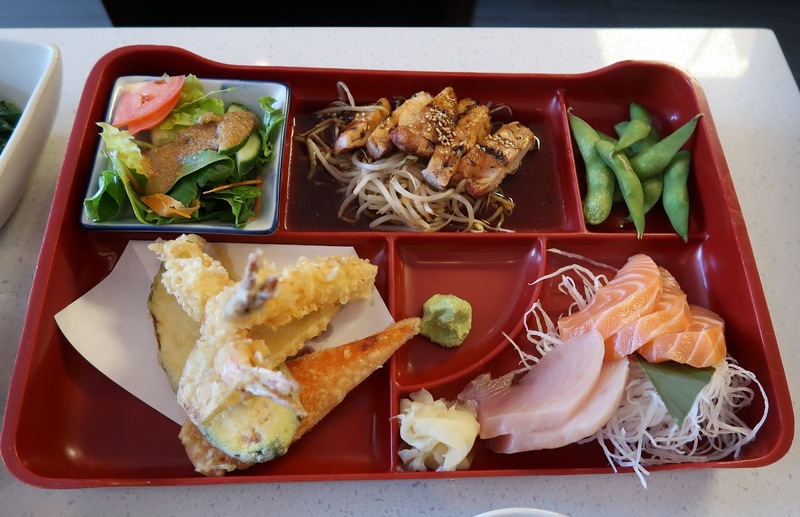 Patrick had the Lunch Box B, which came with a Salad, Chicken Teriyaki, Edamame, Assorted Tempura, Tuna and Sashimi, and some Miso Soup. The Salad was fresh and contained sufficient moisture. 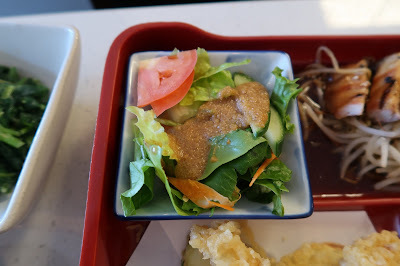 If anything, it would be nice if the Japanese salad dressing was spread out more evenly throughout the mixed greens. Unfortunately, the Chicken Teriyaki was a bit of a flop. The chicken tasted burnt in places and was overdone. 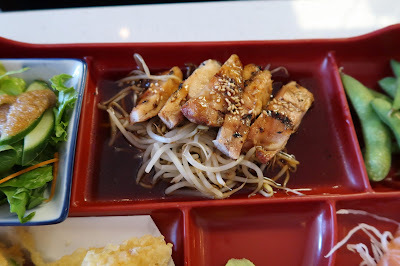 The teriyaki sauce acted as a saving grace by providing much needed flavour to the bean sprouts and the chicken. 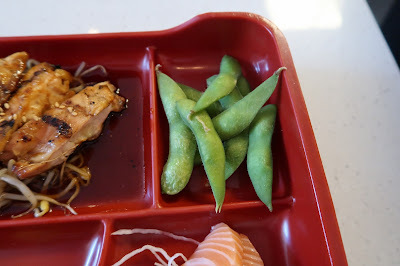 One item that rarely comes with bento boxes is the Edamame. I'll admit that I'm not the biggest fan of edamame because (a) it is not the easiest thing to grade, (b) the beans flew all over the place as I tried to squish them out, much to Patrick's amusement, and (c) you know how most youngsters feel about vegetables. This particular Edamame was in line with the edamame I've had at other places, and it had a nice nutty flavour to it. 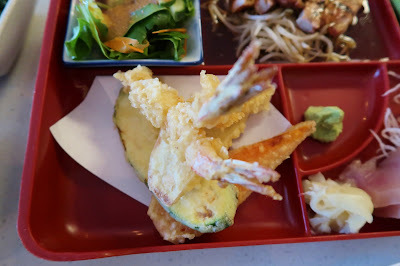 The Assorted Tempura in the bento box came with two prawns and one piece each of carrot, yam, and zucchini. The batter was quite thick and had a prominent potato chip flavour. The prawns were meaty and juicy, and they were the best among all the pieces. 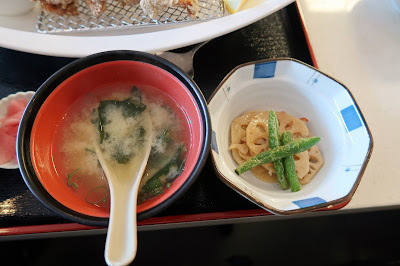 The vegetable tempura tended to be either too dry or sliced too thinly. 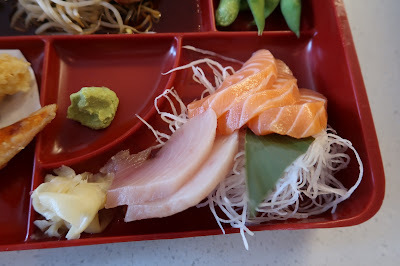 The Sashimi came in neat cuts and was sliced to just the right thickness. The two pieces of tuna were amply soft, but had a slightly fishy aftertaste. Meanwhile, the three pieces of salmon had a delightfully smooth texture, though it was rather weak flavour-wise. 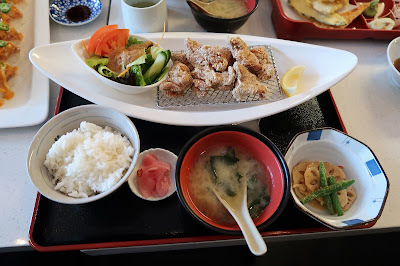 For my lunch set, I had the Chicken Karaage Teishoku, which came with a salad (identical to the salad above), some Chicken Karaage, steamed rice, a Miso Soup, and a daily appetizer. It wasn't until I got to the steamed rice that I realized that I might have ordered just a little too much. The Chicken Karaage came with tender chicken and a rich flavour, but fell a little short of our expectations because it was on the drier side. It would also be nice if the exterior layer was more crispy. Towards the end of my epic meal, I had the Miso Soup, which came with seaweed and green onion. It was not too salty, but the consistency was too thin for my liking. Beside it was a common teishoku appetizer, the Marinated Lotus Root and Green Bean. I liked how the lotus root was not dry at all, and the green bean had a slight crunch to it, though neither of these had a strong impact flavour-wise. The two of us managed to finish all of the food, but in the end, I felt like I had just eaten the whole Pacific Ocean. The waitresses saw what happened and gave us a very stunned look. However, my eating tendencies have attracted tons of stunned looks in the past, so this was nothing new to me. All in all, the quality of the food and service met my expectations considering the price range. 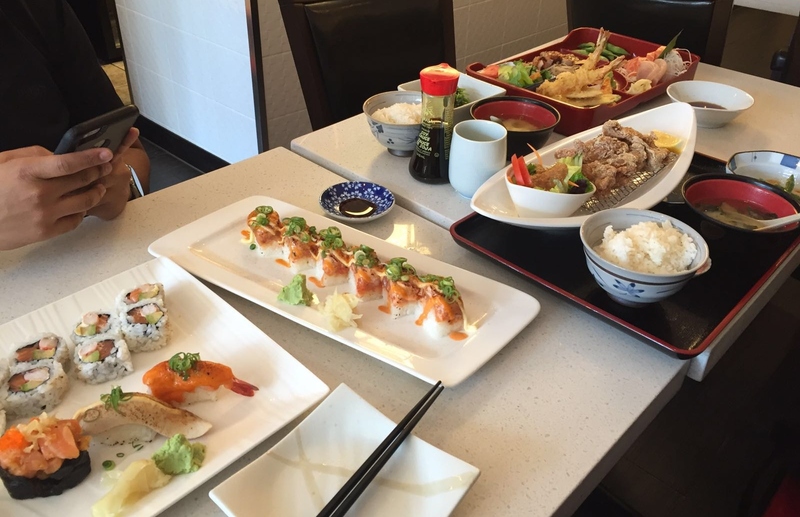 If price is your main concern, head over to Sushi Garden, where you will see some of the best prices for sushi in the city. 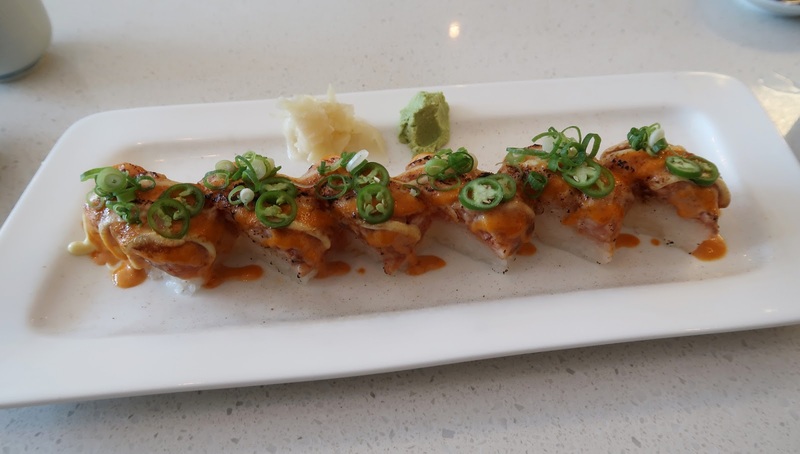 If you would like something a little more refined but still within a reasonable price range, Satomi Sushi is the place for you. I can totally relate to getting a stunned look from the waitresses haha!! Yes we did! I basically didn't have to eat anything for the entire rest of the day LOL. I didn't get a chance to try Yakko, but Satomi is decent and is sure popular! I liked Yakko, and ate there fairly regularly back in the days when I worked at Metrotower. Wonder if the new owner is the same ? I'm not sure ... the owner of Satomi is Japanese though! Do you know if Yakko was Japanese-operated? Yakko was Korean-run, and quite possibly owned too. Probably not the same owner then. The menus are quite different between Satomi and Yakko! Satomi owner is Japanese, wife is Korean. 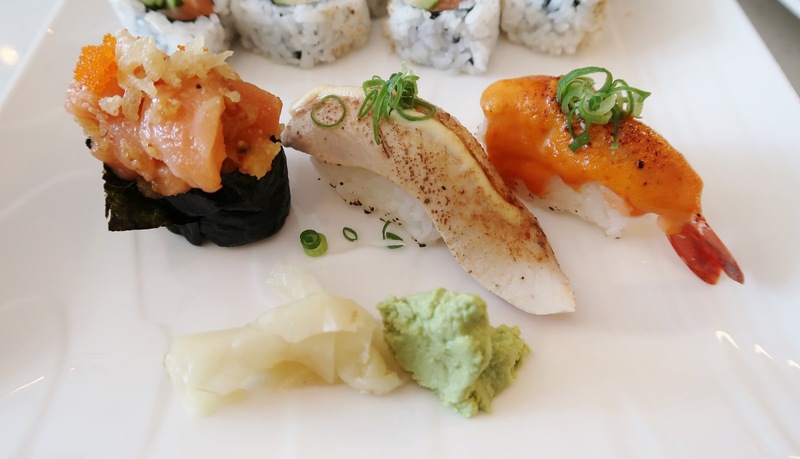 Food is really good homestyle sushi. 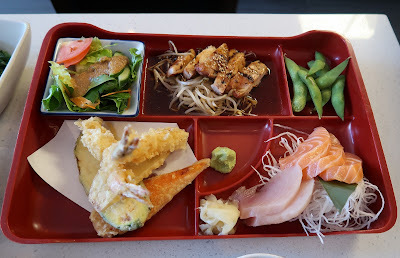 That said, tried the sushi set, while I agreed that the salmon and tuna was about average, the tamago was one of the biggest pieces I ever had and not one of the tamago bricks. I'll make a note to try it the next time I visit!